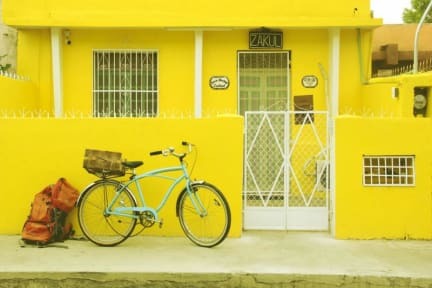 Zakul casa is a cosy home in Mérida downtown. From outside looks like a small yellow house, when you enter its expand and all the art on the walls of the place start to wrap you in to the concept. ZAKUL casa concept is a combination of the relaxing mood of a vacation and the creativity side that come out when you feel chill. The artists that collaborate with the concept as well organize different kind of workshops to get people and guests more involve with their creativity side. The property is a ground floor house with an outdoor pool, garden furniture, hammocks, a swing, ping pong table, sound system, board games, a grill, a TV in the common area, share kitchen, bicycles, Wi-Fi throughout the property and a Wall that you can sign before check out. Zakul casa is 500m from the Zoo Centenario park, 1.9 km away from the Historic downtown, 400m from a supermarket, 650m from Paz park, 2 km from ADO bus station and 7.1 km from the International Mérida Airport. From the downtown starts and ends all the busses that goes inside and outside from Mérida. 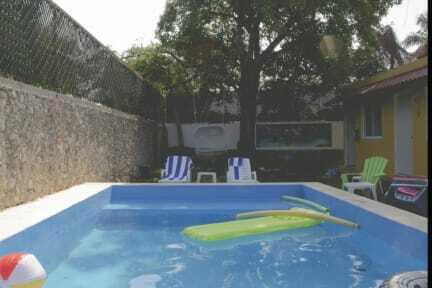 The property offers comfortable private and shared rooms. Xilitla (mix dormitory for 5 persons), Chichen Itza (female dormitory for 5 persons), Agua Azul ( private room, share bathroom, 3 persons), Angel de Independencia (private room, share bathroom, 3 persons), Barrancas de cobre ( ensuite, 2 persons) and Guadalajara ( en-suite, 2 persons). The rooms have name of places or cities from México that are beautiful to visit. The dorms are well-furnished: reading lamp, lockers, connectors, wheel table and body mirror.